Go read JLA #7.2: KILLER FROST in stores today! Quit goofing around on the internet. 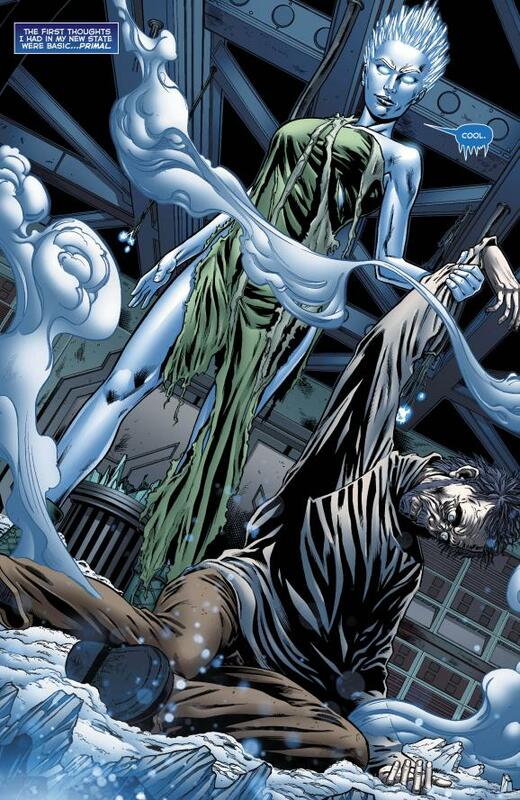 Go read Justice League of America #7.2: Killer Frost in stores today! Firestorm may not have his own ongoing series anymore, but at least we’ve got today’s Killer Frost one-shot to celebrate! This comic features a story by Sterling Gates, art by Derlis Santacruz and Brett Smith, with a cover by Tony S. Daniel & Matt Banning. If you can’t get to the comic shop right now (what’s wrong with you?!?! ), then head over to DC Comics website for a five page preview of this comic! You just might hear a familiar name mentioned (you could even call it an Arctic Blast from the Past)! Below is one of the pages from the preview. Sweet! Pick up your copy in stores today! We’ll talk later. Be sure to leave your comments here! Support Firestorm (and Killer Frost)! Fan the flame! Posted in: Comic books, Firestorm #10: New 52 v2 (Ronnie/Jason), Justice League of America, Killer Frost. ← Forever Evil Update: The New 52 Slipknot has arrived! Have it coming from DCBS! Woo woo woo! You know it! Just read the issue and thoroughly enjoyed it. What surprised and pleased me the most was how dense it seemed. Plenty of text and dialogue that didn’t feel overly wordy, but still seemed like the issue was twice as meaty as the BLACK MANTA and MONGUL issues I read today. I have been a fan of Sterling Gates for a while so I am not surprised how great this issue was. First off, I like the layer the wrinkle in the origin that she was trying to save herself when the accident occurred. She doesn’t want these powers. And they drive her to do the violence she does. I actually felt a bit sad for her, especially at the end. Certainly I never felt that way about the ‘old’ Killer Frost. I wonder if this Frost will ever lash out against HIVE. But I also love the small nods to the past Gates put in. Older fans will appreciate them. Younger fans won’t know they are there. But hearing about Louise Lincoln, seeing she flew from Pittsburgh, and kissing the man to kill him … all nods to the past that an old Firestorm fan like me loved. I only picked up this and Manta’s book and I was pretty happy with both. I’d have to say of the two of them I liked Frost’s better. I had a vague fear that they’d alter Killer Frost to make her Vibe’s Rogue when I first heard about the issue. Why is this a JLA book anyways? It’s clearly a Firestorm book. Ray – No. New character/origin. Loren from the mercenary team in #1 is never referenced.